I usually have a variety of the more popular gold coins available, e.g. Sovereigns, Half Sovereigns, Guineas, Krugerrand, US $20/$10/$5, etc. I am often asked about investing in Gold, particularly in the current economic climate. I AM NOT a financial adviser so all I will say is that the usual suggestion is to hold about 5-10% of your investment portfolio in gold, depending on your attitude to risk. You should also ask yourself are you investing or speculating although the general thought is that you hold previous metals as insurance. There are plenty of investment and financial advisory sites on the web giving detailed analysis both for and against, I suggest you research a few of them and draw your own conclusions based on your own specific set of circumstances. However, many people prefer to hold a physical piece of metal in their possession, which would also be my personal preference. If you are interested in investing in gold, I have excellent contacts with some international bullion dealers and can source larger quantities of coins for those interested, the prices are very competitive (minimum order value €2,000+, payable in full in advance), depending on the quantity required and the market there may be a delay of a few days to fulfill the order but the price is fixed when the order is confirmed. The most popular coins for bullion investment purposes are the 1 oz coins, primarily because they attract the lowest premium above the bullion value. Older Coins with Numismatic interest. Another, slightly more esoteric option is some of the various world gold coin sets, which can often be purchased at slightly lower premiums than even the 1oz. coins, but are less well known, many of these have very attractive designs, so they do provide a more aesthetically pleasing selection, although they are bulkier because of their presentation boxes. They generally have certificates detailing the exact weight and finess of their gold content. Gold Frosted Proof Fifty (50) ECU. 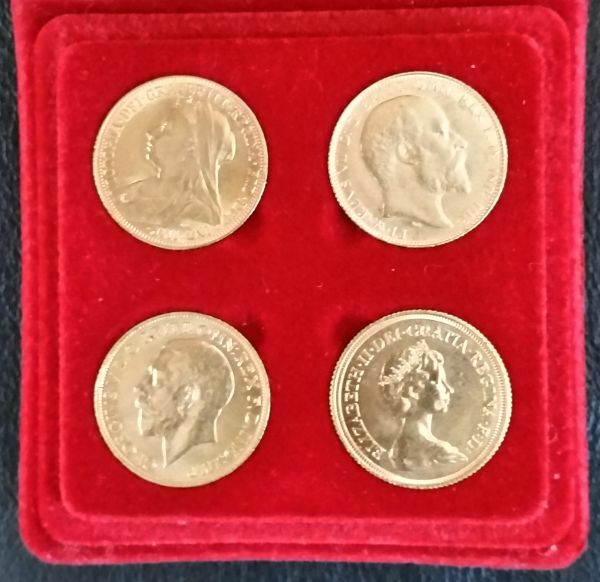 ..
Gold sovereigns from three different monarchs, Victoria, Edward VI, George VII, plus one to show the reverse.